Hi friends! Do you remember my 3 Healthy Halloween food ideas from last year. Well, I realized that the “Dirt” Smoothie Bowl recipe was only available in the video. So, here’s a blog format of it, in case you want easier access to the dets. Be the ultimate Halloween queen or king by whipping one of these “Dirt” smoothie bowl recipes up for your friends and family. What’s In This Dirt Smoothie Bowl Recipe? So, what makes this smoothie bowl look like dirt? Well, it’s a play on the popular green smoothie but with chocolate! Luckily, the chocolate is so pigmented, it takes over the green coloring. Your family will never know there are veggies in here. How’s that for a trick or treat surprise. BWA HAHAHAHAHAHA *said in scary Halloween voice*. And It’s Clean Eating, Too? That’s it! Even the gummy worms are Cleanish thanks to the better ingredient list. Found those guys at Whole Foods, so they passed WF’s rigorous ingredient test. Woop! So, get your fam a spoon and watch them dig in! Careful eating those gummy worms…slippery little guys! Looking for a scary treat to entertain your friends and family this Halloween? 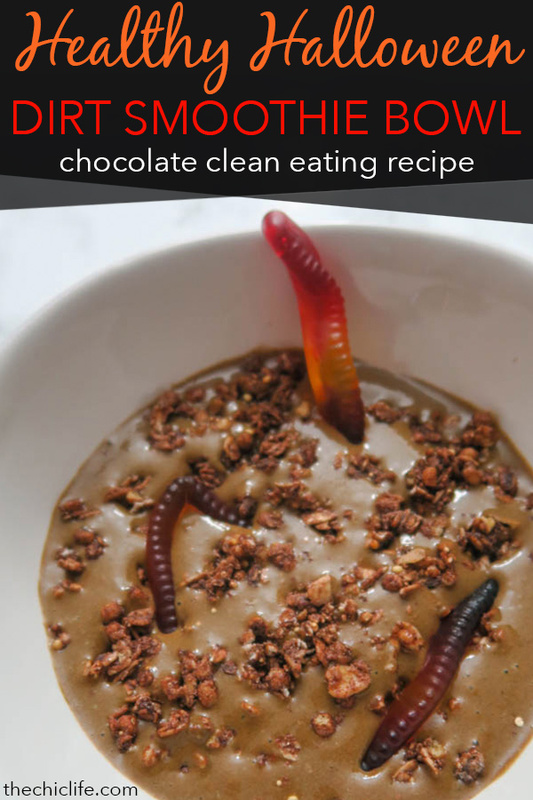 Here’s a smoothie bowl that looks like dirt (complete with worms! ), but tastes delicious. It even sneaks in a veggie serving! Try this clean eating recipe for a delicious healthy Halloween breakfast, snack, or even dessert! Place cacao powder, almond milk, frozen bananas, spinach, and vanilla extract in a blender. Blend until smooth, adding additional milk or water, 1 tablespoon at a time, to get the smoothie blending. Pour mixture into a bowl. Add granola to nearly cover the entire top. 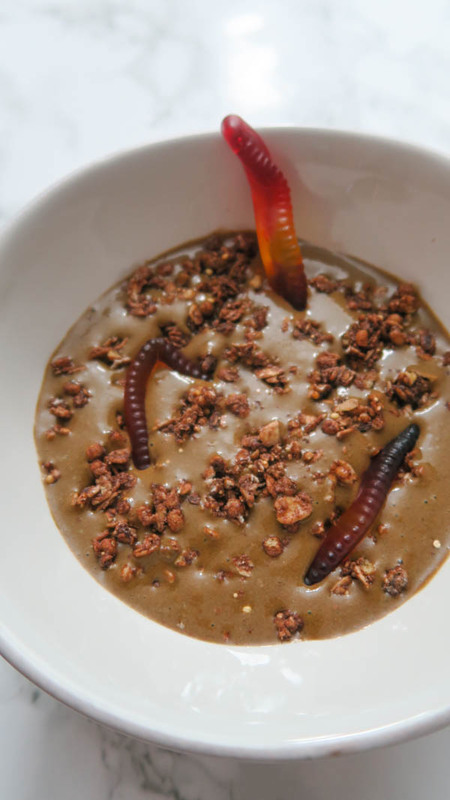 Place gummy worms so they’re visible to the top and look like they’re crawling out of the “dirt”. Enjoy! Click here for the other 2 Healthy Halloween Food Ideas (plus a bonus idea!) – link for the other ideas featured in the video.